A look at the McCoy Sauna and steam company. They are the builders of a fine line of saunas, steam rooms and steam baths. They also provide Mccoy sauna heaters and parts which you can buy to outfit your latest sauna project. Why build a sauna? Because the benefits of sauna steam are simply amazing. 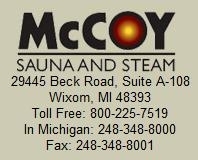 So who or what is McCoy Sauna and Steam? They are a commercial designers, contractors, project managers and builders of world class saunas, steam baths and steam rooms since 1964. McCoy has a reputation of being an expert in the field of designing the architecture of saunas and steam rooms. They offer the ability to design and customize your sauna whether it is large or small to meet all of your requirements. They can build for commercial purposes i.e. hotels, apartment complexes and whatever corporate needs you may have. They also build for homes – no job is too big or small for them to handle. They have a perfect team waiting to manage your project from the beginning – initial sketches and CAD drawings to the final installation. They will continuously provide technical support and all the information you could possibly desire. The best thing about this company is that they can design the shape of your sauna to whatever you desire. They also offer a wide range of saunas. You can get an infrared sauna where they offer a B Series Far Infrared Sauna, an E Series Far Infrared Sauna and you can even create a Customized Far Infrared Sauna Room. The B Series Far Infrared Sauna is the standard version of the infrared sauna which is offered by Mccoy sauna and steam. It is well designed and comes with the standard features. The standard features include both interior and exterior digital controls, an all glass door, a full stereo system with AM/FM as well as CD and mp3. They are also equipped with ceramic flooring and benches which are both heated and light therapy. The E Series Far Infrared Sauna is the elite or luxury version of the B Series Sauna. Many of the standard features are upgraded which include an overhanging ceiling, deluxe moldings, curved door handles, drop down tv and dvd and recessed lighting. Both the B series and E series come in 6 prefabricated models. If you however, desire a custom sauna, you can of course get a Custom Far Infrared sauna. McCoy sauna and steam can design your very own infrared sauna or even convert a previously existing sauna to infrared. Besides designing or installing prefabricated saunas, you can also purchase steam rooms and steam room equipment. They offer both commercial and residential steam generators, steam room controls, prefabricated acrylic steam rooms and even glass doors. At McCoy sauna and steam, you can purchase portable saunas which are extremely easy to put together and are very much similar to the traditional Finnish saunas. If you’re confused whether you should get a sauna or build a steam room, then read our article on Sauna vs Steam Room to get a better idea. All of Mccoy’s products are ETL certified and their best asset is that they provide quality products and materials along with a wide range to choose from. They offer a broad line of heaters: 1.7 kW to 14.4 kW. All of those heaters are either UL or ETL approved. They also build saunas with the best lumber. They use a premium selection of Western Red Cedar. Why is this one of the best types of materials to construct your sauna? Well, it is of course very aesthetically pleasing and it has a great aroma. The wood is highly resistant to decay, splintering, discoloration and becoming warped.